Are you looking for the best Q8 prices? You have come to the right place. 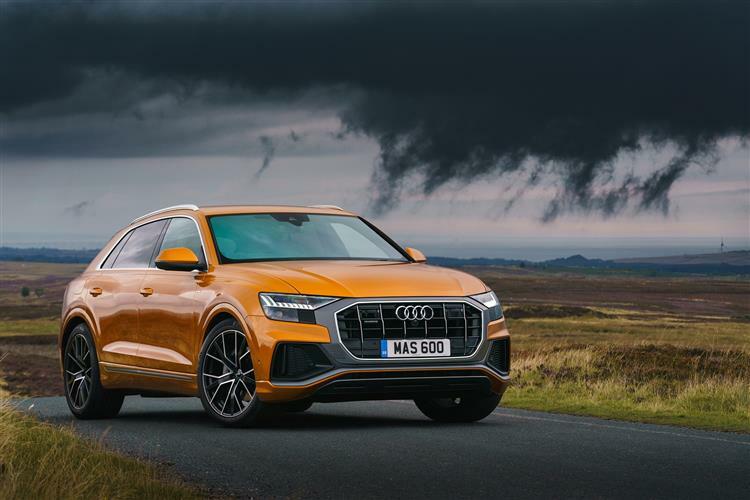 Our Audi Q8 lease deals will save you money on your contract. Get a quote and save £'s today. The Q8 is the new flagship SUV for the automaker. The idea is that it’s an even more desirable vehicle than the Q7. From an aesthetic point of view, it’s certainly more stylish; therefore the Q8 will probably appeal to buyers and leasers on a more emotional level. The car has a coupe-like shape with an athletic stance, a prominent grille and fresh headlights, as well as LED lighting at the rear. Open the doors, and frameless windows confirm the sporty appeal of the Q8. Step inside, and it's immediately evident that the cabin goes the extra mile in trying to please. As with the luxury-focused A8 limo, the dashboard is comprehensively cloaked in a blend of brushed metal and piano black trim. It feels tremendously avantgarde and shows that Audi has built a car that now truly takes the fight to the Mercedes-Benz GLE Coupe and the BMW X6. Both these motors have come to epitomise the luxury coupe SUV segment in recent years. The interior design focuses around the excellent infotainment system. This consists of a large, intuitive, 10.1-inch screen in the middle of the dash with a lesser 8.6-inch display housed above the centre console. This provides easy access to other functions, like the climate control and radio. Audi’s 12.3-inch Virtual Cockpit digital dashboard panel is also fitted and, like the infotainment system, is straightforward to use. As for room, there's lots of it. Space for the passenger and driver is immense, and things are good in the back, too. Even headroom isn't compromised by the coupe design. This is because the sloping roof kicks in more over the load area than the Q8’s cabin. This does mean that boot space is restricted to 603-litres, but that’s still big enough to swallow the family shopping and a bunch of suitcases at the same time. There’s no seven-seat option though, which might prove to be a deal-breaker for some people. On the move, the Q8 feels akin to other large modern Audis. The steering feels light and smooth around town, weighting up well when on the open road. It's also very accurate and responds precisely to directional changes. Furthermore, unlike the lesser Q7, the newcomer is fitted with air suspension as standard. It’s even got Sports air suspension in Britain; but to enjoy its cruising talents, it’s best driven in its most comfortable mode. Engage the Dynamic setting, though, and the SUV turns into a beast, taking corners like a sports car does. However, the weight of the Q8 soon reminds you to calm things down. The ride also becomes a little too stiff, and this makes the Audi sensitive to poor road surfaces. The Dynamic mode is, therefore, best used on smooth, new tarmac – if you can find any in the UK! The Q8’s 3.0-litre V6 powerplant is mated to a 48v mild hybrid system for flawless engine coasting and shut-off at motorway speeds. And although the 0-62mph in 6.2 seconds performance doesn’t feel as rapid as you’d think, the Q8 still delivers pleasure. More than that; it’s also a very refined SUV with an easy-shifting eight-speed automatic ‘box helping to seal the deal. So, there are many reasons to bypass the Q7 and go for the all-new Audi Q8, but price won’t be one of them. The Q8 starts off at £65,040 and goes all the way to £83,040. Mind you; you won't need to have a bank balance the size of a EuroMillions jackpot winner's if you decide to lease one instead. The engine in the 50 TDI model, as tested, is the only one for the time being, but it’s a unit you'll be pleased with. Why? Because it’s a sophisticated SUV with enough performance to keep you excited without pushing you into licence-losing territory.